Mexico City brims with life that comes from every corner of society. The rich walk their Chihuahuas, or push them in pink prams, whilst shopping for organic doggie treats sold on the side of the road. On the very same streets families sell cups of maize coated in chili and lime to try and get by. 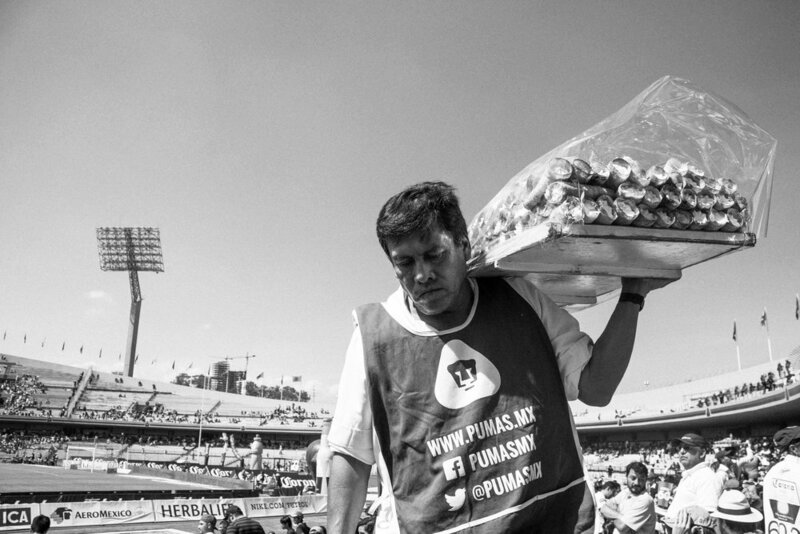 Mexico City is truly the city of labors, of trabajadores. The Metro itself has an economy; vendors alternate between carriages at each stop selling anything from bibles to posters of pin up girls. You can find entire streets that dedicate themselves to nothing but the sale of pieces of paper, ticking watches, or the skin for the top of a drum. I’ve heard there is one street that is roamed almost exclusively by blind people, playing children’s instruments, whilst silently asking for the change in your pocket. In a city with such an extremely wealthy and secular population, where people opt to take their helicopter in order to travel downtown instead of face the traffic, I became fascinated by the ways in which the remainder of Mexico City’s 21 million citizens got by. 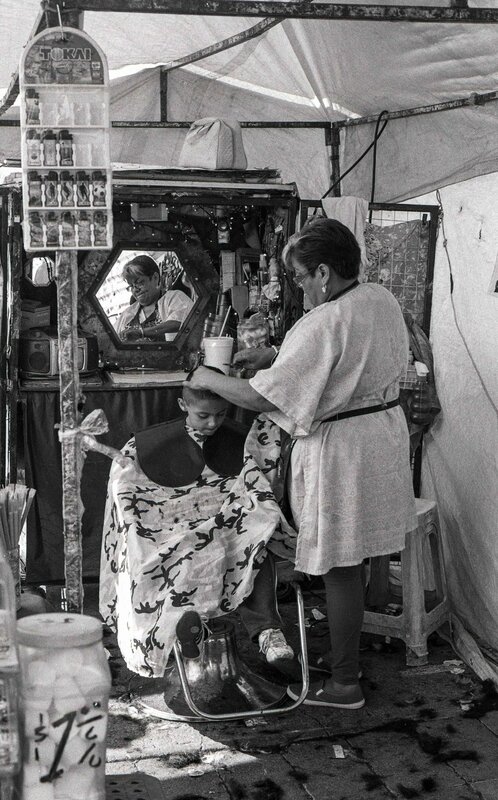 My photography became a quest for documenting fragmented moments of exchange and labor in the streets, of boys getting their hair cut in markets, or of men selling snacks at football games. I often found myself stumbling across surreal moments of silence where a person would stand completely still admits the noise and frantic pace of the city. Sometimes they’d be surrounded by their goods for sale, or other times seemed to simply belong to a part of the cities landscape, where a leaned on lamp post became a place of home and refuge for hours on end. When I left the city to see more of Mexico, I started to find more of these silent moments and began getting closer and taking portraits. What resulted was another kind of exchange – where I’d attempt to explain why I’d asked for a photo, and would listen to whatever story the person in the photo had to offer. Never getting to far with words, the photos are something of a glimpse into the rhythm and pace of Mexico, its people and its poetry. 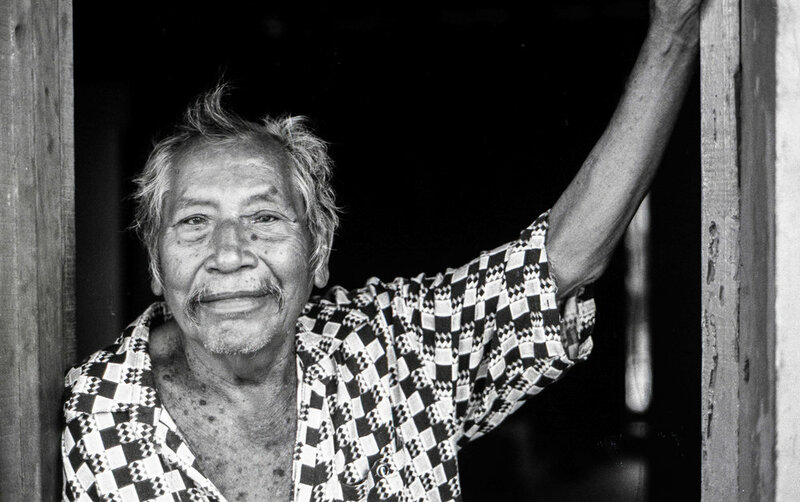 Casa Tochan, our house in Nauhatal – an ancient language of the Aztecs, is a refugee shelter based in Mexico City, whose aim is to provide support to men fleeing from gang violence in Central America. The countries most affected are Honduras, Guatemala, and El Salvador, otherwise known as the Northern Triangle. Data states that citizens of the Northern Triangle pay more than $651 million annually to gangs. A staggering number for countries that also see inhabitants struggling to make ends meet. The shelter is big enough to house 12 men at a time. Here they find some of the only means of support available to them throughout their journey. Migrants are known to fall pray to gangs who will take advantage of the desperate and vulnerable in whatever way they can. Sometimes people would arrive at Tochan having not eaten or drunk in days, with nothing but the clothes of their back. Some people wouldn’t even have made it as far as Tochan. All donations will go towards maintaining the house and ensuring that those who stay there can be fed and cared for during their stay. To enquire about volunteering for Casa Tochan, please fill out the form below.